Food hybrid trends are not going away anytime soon. And for those of you who thought the fanfare over sushi meeting a burrito was a short lived fad, the reality couldn’t be further from the truth. In fact, the trend has only grown in the last year, with more food hybrid trends popping up than ever before. Not too long ago, I myself ventured in the Village and tried a Churro cone. 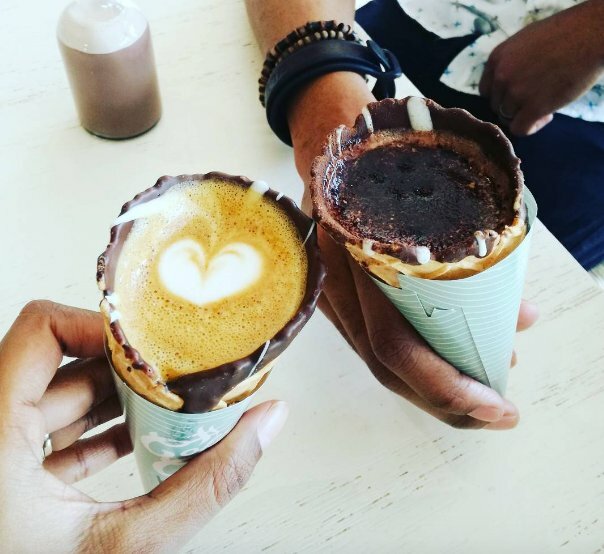 We didn’t totally love it, but that doesn’t mean I don’t think coffee in a ice cream cone doesn’t sound amazing to try. Plus, more importantly, a top notch Insta setup. Here are a few food hybrid trends, some newer, some already out in the world that you should start tracking now. And if they can be found in your local city, even better. 1. 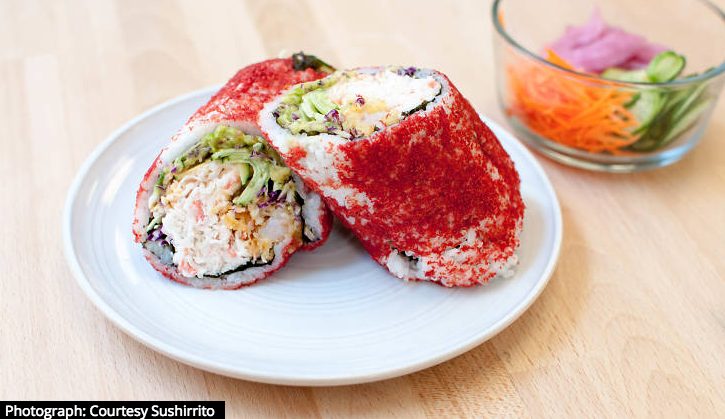 The famed Sushirito. Copycats of food hybrid trends are a dime a dozen. But usually, the original is hard to beat. In this case, the original sushi burrito from San Francisco which migrated over to our neck of the woods not too long ago. 2. Ice cream Ramen. This treat by New York desert shop The Dessert Kitchen might be a little polarizing, but personally, I’d love to try it. Plus, it comes in my favorite color, minty blue.The concoction is made by covering crushed ice with evaporated milk while mixing it with traditional Japanese jelly noodles. 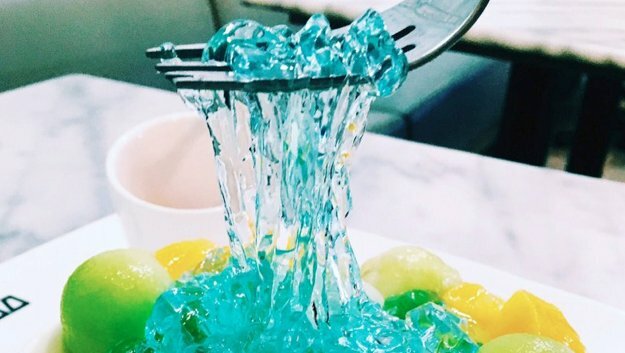 The transparent, blue noodles are served over ice, Mochi ice-cream, cantaloupe and mango, covered with the milk, and finally, served with a side of syrup. 3. Coffee in a cone. This trendy new food hybrid, already overpopulating Instagram feeds comes to us from The Grind Coffee Company in Johannesburg, South Africa. Wish I could drink coffee out of a cone here in the good ol’ US, but I’m sure they’ll come up with something soon. 4. 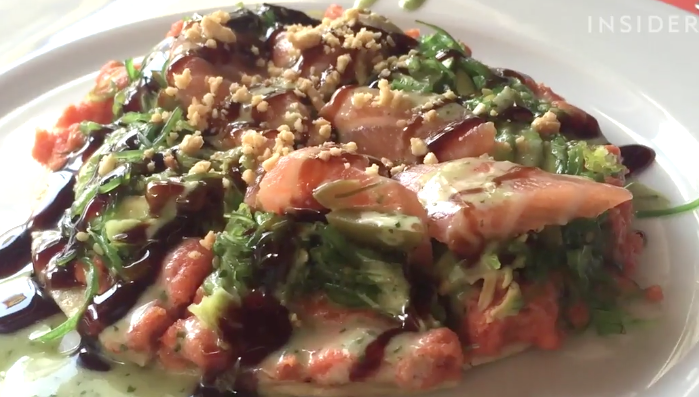 Sushi Pizza. It sounds like it might be an odd combo, but once you watch the video on Insider Food, you’ll want to try it anyway. 5. 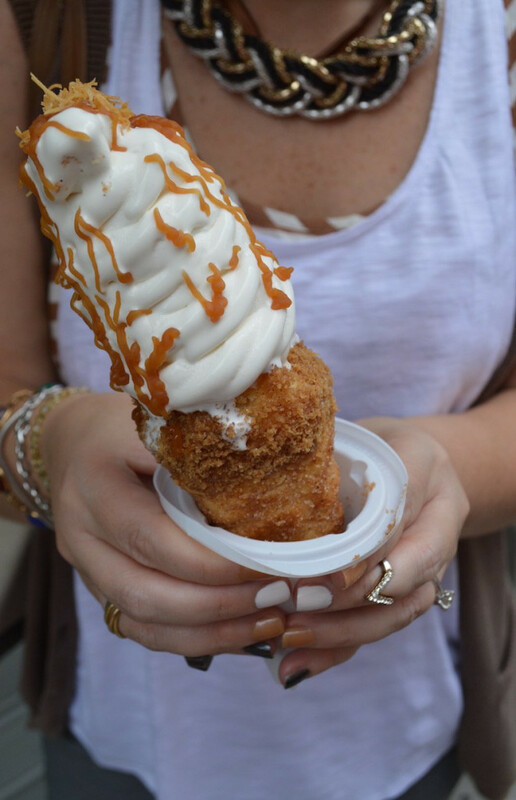 Churro Cones. As previously mentioned, earlier this year we ventured into the Chickalicious Club in the East Village to try their churro cone; a combo of churro and ice cream in a cone. I’d been anticipating the visit, but sadly, had to admit to not being overwhelmed. I still love a churro any day of the week and the treat was tasty. But issue remained more in principle, as the cone tasted nothing like a churro. So while my sweet tooth was satiated, my churro quota was not. Also, it’s hard to photograph; always a mark against you in this day and age. All that being said, I still recommend checking out this tasty food hybrid trend treat. 6. Oreo Bagels. If you can be counted on to have Sunday bagel cravings, AND never turn down desert, then this food hybrid is for you. 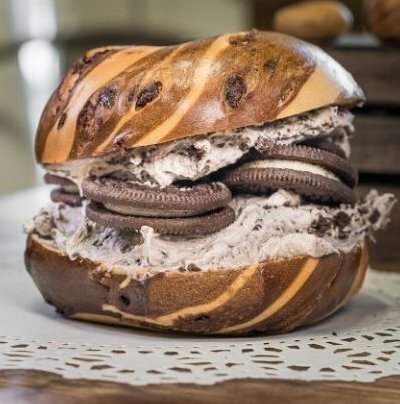 The Oreo bagel hails from The Bagel Nook in Freehold, NJ. Their sweet, Sunday morning creations can be found in their New Jersey bagel shop, or ordered online at Goldbelly.com. 7. Donutccinos from Gossip coffee in Astoria, Queens. Essentially one of the caffeinated food hybrid trends, this blending consists of an already perfect pair, coffee and doughnuts. 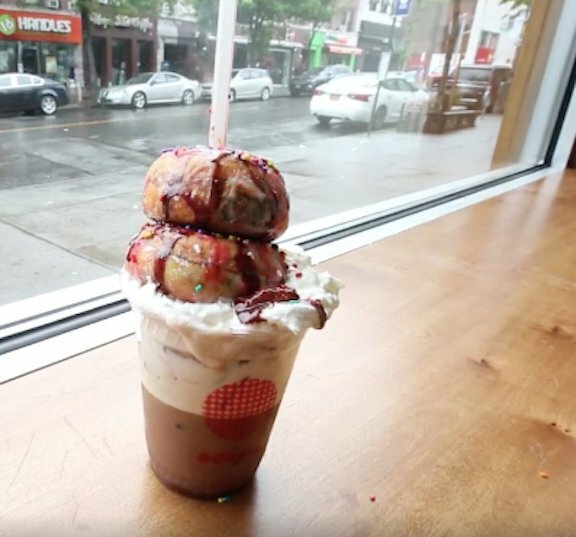 A giant cold brew coffee has doughnuts placed on top. 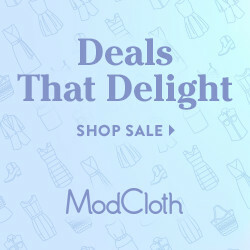 What could be better?? 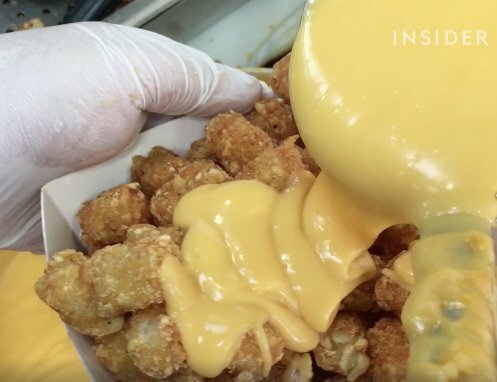 Watch the video on Insider Food here. 8. Tater tot nachos. These tater tots with nacho inspiration, actually called Drunken Sailor Tots, are featured at Mess Hall Canteen in Los Angeles. Start with tater tots, add loads of nacho cheese, bacon bits, hot mac & cheese, lobster and snow crab, and top it off with Wasabi Aoli. 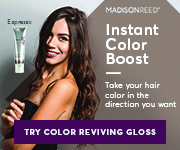 See their full creation at Insider Foods. 9. 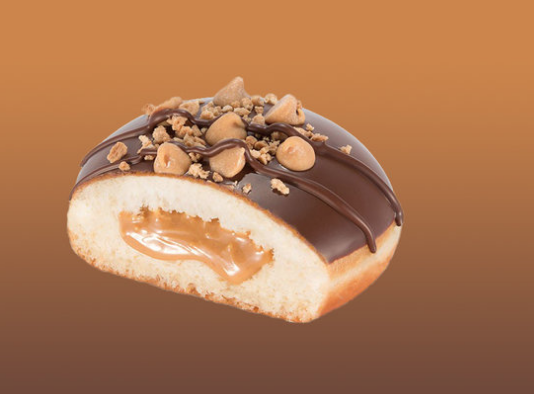 Reeses Peanut Butter Krispy Kreme doughnuts. What else needs to be said here. Mix one of the best tasting doughnuts around with one of the most beloved chocolate candies and you get one of the sweetest food hybrid trends worth buzzing about.